Ah Valentine’s Day. A day of the year where most of us jump onto Google at the very last minute to find some sort of gift or dinner option that shows how much we appreciate our other half, but a lass you find that Webersburg Bistro is not hosting their amazing Valentine’s Dinner this year due to private functions and most of the romantic gifts are already sold out. What to do? Well, our amazing Chef Nadia Roux decided that the love at Webersburg will not wilt away this Valentine’s day and wanted to share one of her romantic desserts. White Chocolate Semifreddo. Our old faithful is the salted butterscotch, macaroon and honeycomb popcorn version however for this special day we recommend mixed Berries of your choice, but it’s all up to you. 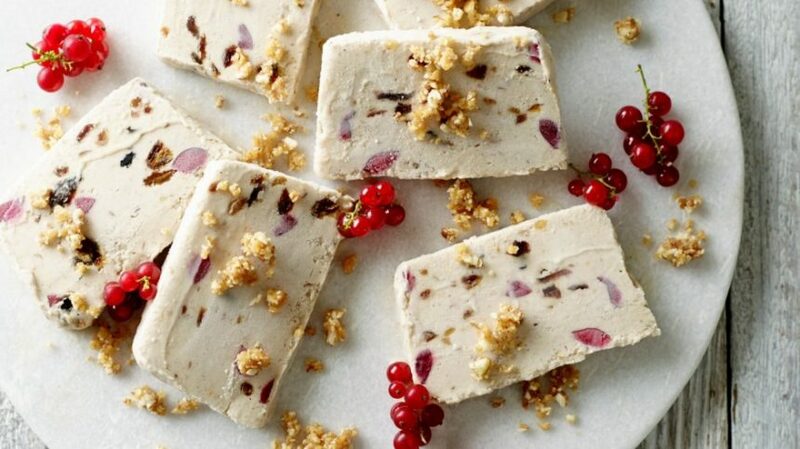 Semifreddo is very much a blank canvas. Below you can find the step by step instructions on how to prepare this delicious dessert for your significant other. Whisk the egg yolks and sugar until sugar has dissolved and the mixture is thick, white and creamy. Now add your vanilla essence. Fold in gently. When the chocolate is melted to a smooth consistency, add it to the egg and sugar mixture and fold it in gently. Add some of your berries into the mix and fold in gently. Now whip up the 2 cups of cream to medium stiff peaks. Fold the whipped cream into the white chocolate mixture and spoon it into a bread tin that has been lined with baking paper or plastic wrap. Smooth it in with palette knife and freeze for about 2 to 3 hours. Consistency will be that of ice cream when ready. When you are ready to serve up the dessert, fill your sink with some warm water and dip the bread tin into the water for about 15 seconds. Gently turn over the bread tin and turn out the Semifreddo loaf onto a rectangular plate. Add some fresh berries of your choice and a couple of sprigs of mint over the top and enjoy your this creamy delight.